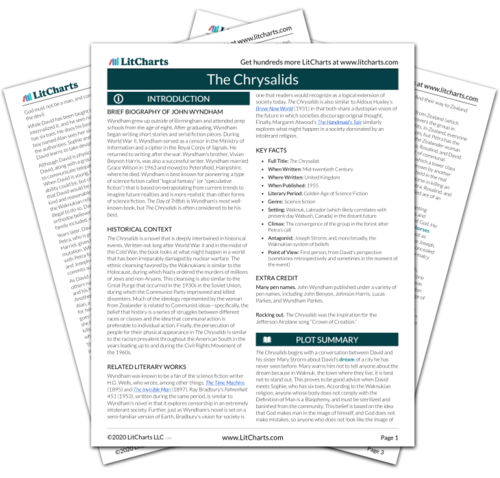 Instant downloads of all 941 LitChart PDFs (including The Chrysalids). Waknuk operates under a set of laws and beliefs that discriminates against anyone or anything that does not look “normal.” Those who appear different in any way from the Image of God as prescribed by the Definition of Man are segregated from society and sterilized, so that they cannot produce more Deviations. The Chrysalids exposes the hypocrisy and ludicrousness of any society that kills its members in an attempt to be more pure and moral. This is, of course, a morally reprehensible act, and a deeply misguided one. The people who are the targets of this moralistic racism prove to be those with the highest moral standards, and the novel makes a clear statement about the impossibility of determining someone’s character from their appearance. While much of the racism in the novel is driven by religious doctrine, this doctrine is fueled by a fear of the unknown. Rather than explore the world, the Waknukians isolate themselves to an extreme extent—so much so that they will go to extraordinary lengths to keep out the rest of the world. The Zealanders show a greater willingness to travel and explore, but they exhibit supremacist and xenophobic (a fear of foreigners) tendencies as well. Although the Waknukians actively seek out Offenses, while the Zealanders are more tolerant of difference, the Zealanders also show no compunction over killing those who they deem to be racially and intellectually inferior. The fact that Waknukians would classify Zealanders as Deviations, while Zealanders consider Waknukians to be an inferior race deserving of death because they lack the ability to telepathically think-together, demonstrates the highly arbitrary nature of racism. This discrimination has nothing to do with truth, but rather is based on characteristics that are detested in one culture, but valued in another. Wyndham also forces the reader to think about this racism in a critical and personal way. Like the Waknukians killed by the Zealanders, the reader is not capable of think-together, and thus must wonder how he or she would fare in this world. The ThemeTracker below shows where, and to what degree, the theme of Racism and Fear of the Unknown appears in each chapter of The Chrysalids. Click or tap on any chapter to read its Summary & Analysis. Below you will find the important quotes in The Chrysalids related to the theme of Racism and Fear of the Unknown. “‘Why should they be afraid of us? We aren’t hurting them,’ she broke in. Walker, Lanier. "The Chrysalids Themes: Racism and Fear of the Unknown." LitCharts. LitCharts LLC, 25 Aug 2015. Web. 17 Apr 2019. Walker, Lanier. "The Chrysalids Themes: Racism and Fear of the Unknown." LitCharts LLC, August 25, 2015. Retrieved April 17, 2019. https://www.litcharts.com/lit/the-chrysalids/themes/racism-and-fear-of-the-unknown.